RTV106 one-component, ready-to-use adhesive sealant is extremely versatile. It cures to a tough, durable, resilient silicone rubber on exposure to atmospheric moisture at room temperature. Acetic acid vapors are released from the sealant surface as a by-product of cure. RTV106 sealant is paste-consistency sealant. 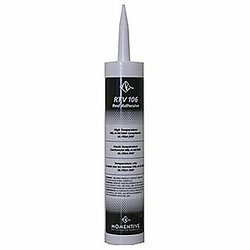 RTV106 sealant is standard strength high-temperature sealant. Since the sealant utilizes a moisture cure system, it must not be used in thicknesses of greater than 6mm (1/4 in.). Where section depths exceed 6mm (1/4 in. ), GE Silicones one component, addition cure or two-component silicone rubber compounds are recommended. The company came to life in 2013, with an aim to deliver the best quality products to the customers and establish a reputation for itself among a large sector of the industry. Since then we have been engaged in the Manufacture, Trader, Supplier and Exporter of a wide array of premium quality of Inter Comp Weighing Scales, Performance Materials Momentive, Tapes 3M, Silicone Sealant. We are exclusive distributors for ELIDE FIRE BALL for Maharashtra State.